King Climbers has been established for over ten years. We offer a wide range of courses to meet all levels of climbing ability. 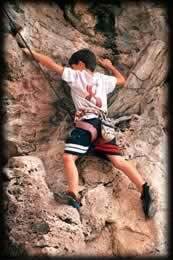 It doesn't matter how old or young, unfit or uncoordinated, our instructors will find something you'll enjoy climbing. If you are looking for one on one tuition or coaching, you can hire a private guide. We offer three standard courses (see below). These courses are geared for complete beginners and intermediate climbers. If you are interested in doing something else, or wish to extend a course, then we will be more then happy to accommodate you. Hotel pick up from the Krabi/ Ao Nang area can be arranged for 200 Baht per person. If you wish to make a booking please fill out the form below. We will process the booking and confirm the dates via e-mail. This takes approximately three days. If the dates you have selected are unavailable we will e-mail the closest possible available vacancies. The courses include our guide and all equipment and insurance. The only thing you need to bring is your camera! We keep our guide to student at one guide with no more than four students ensuring high teaching standards. 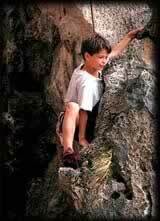 This is the way you will start out climbing. Your instructor will first climb to the top of the route and loop the rope through a fixed anchor. Once back on the ground you will be attached to one end of the rope which runs through the anchor at the top of the climb and back down to the instructor. 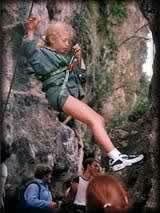 A belay device is a fail-safe device which lets the instructor keep your rope tight. While you climb the instructor tightens the rope, keeping it firm so that if you slip you are safe, or if you get tired you can let go and be suspended in your harness in complete safety. This is a great way to learn which leaves you plenty of time and energy to concentrate on climbing or to simply enjoy the view. In Thailand all leading is done on stainless steel bolts that have been drilled into the rock. The lead climber on ascending the route clips onto the bolts and clips the rope through quick draws. This is the safest and easiest way to lead a climb. Due to the nature of limestone rock all routes are bolted and therefore we are unable to offer any courses on natural protection climbing. 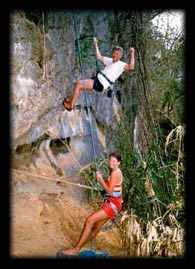 Rappelling, also known as abseiling, is a means by which climbers lower themselves off the rock. Climbers put the rope through a belay device attached to their harness. They then slide down the rope using the belay device to control the speed of their descent. This not only makes for good pictures but is great fun! We have never had an accident on one of our courses, and we'd like to keep it that way. However this doesn't mean we aren't prepared. All of our instructors are trained in first aid and emergency and we provide insurance for the duration of our courses.